Extended Life – Thousands of Hours in Clean Vacuum. Guaranteed Life (Measured in Surface Loss). Guaranteed Against Mounting Structure Failure. Exceptional Stability – Thermal/Chemical/Electrical. Precision Machined Carbon Mounting. High over-temperature Tolerance. High Brightness/Low Energy Spread – Oriented Single Crystal. Best-Quality/High-Purity Material. Accurate Microflats – Superior Optics/Controlled Source Size Standard Diameter Available. The new improved Kimball Physics Model ES-423E (Extended Life) LaB6 Cathode is a high performance, resistively heated, thermionic electron source. The improvement stability of the LaB6 crystal, results in less exposure of LaB6, which reduces Wehnelt aperture contamination. Its lifetime is in excess of 6 months with continuous operation. Continuous operation at the full operating temperature improves the thermal stability of the gun and hence beam current stability. It is no longer necessary to wait hours for stable beam conditions in order to perform quantitative EEL or EDX measurements. The emitter is machined to 15+/-2µm diameter (standard), microflat alignment to the instrument base can be provided (on request), oriented-single-crystal, <100> surface. Mounted on the end of a single-piece, stress-free, carbon heater rod, held in place by a carbon ferrule. A high degree of axial symmetry provides great mechanical stability. The rod has a 100µm slot along the axis, which allows the heating current to go up one side and down the other. In SEM type instruments, its lifetime is up to 3000 - 4000 hours In TEM instruments the lifetime can be even longer. Mounting structure will last more than 10,000 hours. Chemical reactivity and mechanical drift problems have been eliminated. While the cathodes can be fitted to virtually any instrument, there are several requirements needed for achieving quality results. The most important requirement is for clean vacuum, with partial pressures of oxidizing gases being kept below 10-7 torr in the electron gun. The condition of the cathode itself, along with that of the Wehnelt aperture, may often be used to verify the partial pressures in the gun. 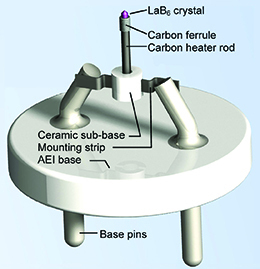 The cathode must be accurately and correctly positioned behind the Wehnelt aperture. There must be controlable bias resistors which can reach adequately high values; some instruments are limited by values which are to low. For most SEM's and TEM's, the standard Styles 90-15 (90° included angle with a 15*m flat) is recommended. Style 90-15 (90° included angle with a 15*m flat) is recommended for Leica/Cambridge. Style 90-06 (90° included angle with a 6*m flat) is for high resolution, and selective TEM's. This cathode provides higher brightness, but with some compromise in lifetime. Specify Instrument Manufacturer and Model No. Specify Type of Instrument: SEM, TEM, STEM.